Our Managing Director, James Collis Pritchard, joined forces with Henbury Court Primary Academy on this incredible transformation project, which saw a complete overhaul of the Bristol primary school’s outdoor grounds! 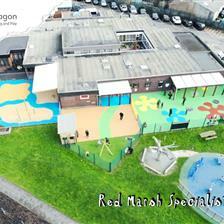 This exciting project featured a dramatic improvement to the outdoor play and learning facilities for EYFS pupils. Outdoor Learning has been reinvented at Henbury Court with the arrival of a brand new free flow School Canopy. We carefully removed and disposed of the old worn canopy, before making good use of the area and installing a brand new one! The canopy itself is made from a beautiful pressure treated timber which adds a natural feel to the space. We designed it complete with glazed ends to allow light to flow through and to connect the area with the stunning countryside view bordering the school. This new outdoor learning area for nursery and reception children has the added benefit of built in matching wooden Display Shelving, 2 Chalkboards and Whiteboards for lessons and mark making, and 2 Self-Selecting Stores for child-led play. The Artificial Grass installed underneath the canopy is soft to the touch and ensures that the area can be used all year round. 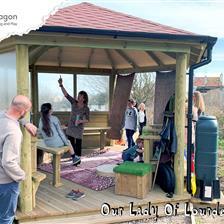 An Outdoor Classroom such as this is a brilliant way of extending the existing teaching space, and encouraging plenty of easy freeflow play between the indoor classroom and the outdoor environment. You can view our full range of Outdoor Classrooms here. Henbury Court’s Early Years playground is now an inspirational area where role play, investigative play and learning feature high on the agenda. Most of the play equipment is made from the same pressure treated play grade timber as the Outdoor Classroom. This means that the areas really flow and compliments each other visually, upholding the natural feel of the play space. Key to the redevelopment was the installation of All Weather Artificial Grass, to ensure that the entire area can be used all throughout the year without becoming muddy or waterlogged. It would be torture for the children to be prevented from using their favourite play equipment during the wet winter months, as is so often the case. Not at Henbury Court though! It’s also much more gentle and forgiving than a tarmac playground, minimising risk of injury through slips and falls. A new Giant Playhouse with Walls and Chalkboard is currently being used as a comfortable and relaxing sheltered space for outdoor reading. It’s a versatile space that Henbury Court can adapt every term as they wish to support learning topics. Two fabulous Wigwams sitting alongside two Small World Seating Circles have created a brilliantly named “Tipi Village” at Henbury Court, facilitating opportunities for role play, den making, positive social interaction and friendship building in the playground. This equipment is designed to give children the freedom to fully express themselves and to boost their confidence. It’s a friendly and welcoming environment which encourages turn taking, and listening and responding to other children’s ideas. The favourite Mud Kitchen, the Rope and Pulley Materials Mover and the Dig Pit tie in together perfectly, creating a superb explorative, messy and sensory play area which the children love testing out. Measuring, pouring, testing their own influence, learning cause and effect, it’s impossible to run out of things to do with them! Pentagon’s top class Water Wall has caused quite a stir at Henbury Court. Children can plot and build their own course with the water channels, experimenting with speed and direction of flow. They can guide the water through the spinning wheel and discover all sorts of scientific concepts for themselves. It’s a brilliant teaching resource for science and mathematics as much as it is a favourite water play piece. Joined with 2 new Water Tables and 2 Covered Sand Tables, it’s a busy messy play area where resources can be used in conjunction with other. There are 6 Storage Benches for keeping toys and resources safely and conveniently stored outside. The 3 Tuff Spot Tables and Easel Tables allow plenty of hands-on exploration and mark making opportunities. Whether it’s mini-beasts discovered by children in the playground, sensory resources presented by the teacher, or small world toys set up as an inviting display, these are versatile outdoor play pieces that will make outdoor learning a daily feature at Henbury Court. Hats off to our team of designers, they have created a truly awesome playground centrepiece with our Langley Play Castle! It’s a mammoth wooden play castle offering numerous exciting and challenging elements to explore, and versatile spaces for high energy outdoor play. Children can scramble up the nets, climbing walls and ladders, charge around the battlements, slide back down the chute, and plot their plans in the dungeons underneath! The perfect outdoor resource for crossover between both active and imaginative play and learning, staff and children alike have been thoroughly enjoying its many benefits at Henbury Court! Importantly, the Nursery children at Henbury Court have been learning how to climb and balance safely on their new play castle. It’s an ideal resource for teaching children how to assess and manage risk for themselves so that they can keep themselves safe - a vital life skill. There is plenty for them to hold onto and support themselves, and the playturf underneath provides a soft landing if anyone does take a tumble. And on top of that, it is really good fun! We are delighted to hear that the children at Henbury Court are enjoying exploring these new outdoor areas, and that the staff are able to make full use of them when planning the children's learning activities. The school have displayed some wonderful sunny photographs of the outdoor areas in use on their website and on social media, referencing the “fantastic work” and how Pentagon have helped them to realise their vision for their school grounds, which they are extremely proud of. At lunchtimes and across all play times, staff at Henbury Court work hard to ensure that children have lots of opportunities to play in different ways. They are lucky to have lots of space for their children to play. And this breathtaking new development has really taken the scope for both outdoor learning and outdoor play at Henbury Court to marvellous new heights! Are you considering a redevelopment of any part of your school grounds? Would you like us to come and visit you to provide a free consultation? Please do not hesitate to get in touch with us by completing our Online Form or by calling 01625 890 330 (North Office) or 0117 379 0899 (South Office). 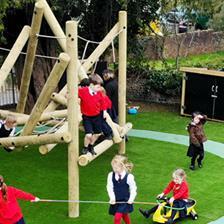 You can view Pentagon’s full range of outstanding EYFS Playground Equipment here.